On Sunday 24 May, Berwick is holding its first Mayor’s Parade with horse-drawn vehicles, vintage vehicles, historically-themed floats and characters representing themes from Berwick’s history and the town’s guild and trades through the ages, Deans of Guilds in their ceremonial robes from Aberdeen, Arbroath, Ayr, Berwick-upon-Tweed, Brechin, Dundee, Edinburgh, Glasgow, Lanark, Perth and Stirling. It starts in Castlegate at 11.45am at the War Memorial, goes down Castlegate, into Marygate, up Church Street, to the Parade ground. More information. 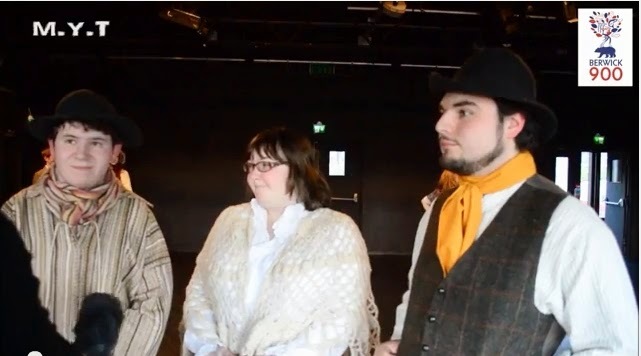 Some of the historical characters including George Manuel a crab fisherman; John Crombie; Dr Philip MacLagan and his son, Dr Charles MacLagan are played by actors in this Maltings Youth Theatre video. The picture shows George Manuel; his wife, Margaret; and John Crombie.